The replacement NASA building 4602 is an 83,000 square foot building consisting of offices, specialty laboratories, and material testing laboratories. The building contains 65,000 square feet of conditioned space and 18,000 square feet of penthouse mechanical room which houses the four custom built air handling units. The HVAC system is divided into two systems, one serving the general office area which utilizes one 24,000 CFM air handling unit, and four 30,000 CFM air handling units that serve the lab spaces. 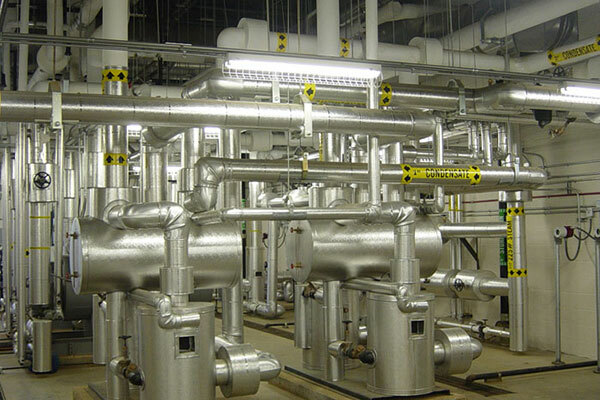 The heating hot water system is generated through heat exchangers using the base wide steam system, and the chilled water system is fed from the centers central plant via underground piping. The AHUs have humidifiers that are served by clean steam generators located in the first floor mechanical room. Other systems in the building include the plumbing, a 3500 psi missile grade air system, a 150 psi missile grade air system, liquid and gaseous nitrogen, a gaseous argon system, and a process chilled water system which is served by a 40 Ton air cooled chiller. This facility will be used for materials and systems research and testing for future space and government programs.